I’d heard stories about ‘Jocks Road’ but until recently I had never been on it. The ‘Jock’ concerned was Jock Winter, a shepherd, who gave his name to this, the most famous of all Scottish rights of way. This route was the centre of a huge legal dispute in the 1880s which led to the bankruptcy of the Scottish Rights of Way Society, and cost the man who had blocked it in the first place what would today amount to around a million pounds. 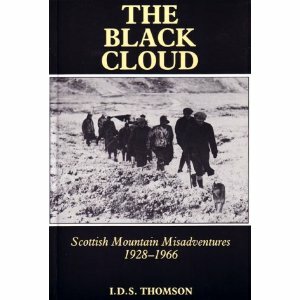 I think I first heard of it in the book ‘The Black Cloud’ by IDS Thomson, which related the story of a party of five walkers who were making their way from Braemar to Glen Doll on 1st January 1959. Coming out of the corrie and on to the plateau they were met by horrendous conditions, driving snow and windchill temperatures of up to -25 degrees. All five were experienced mountain men, members of Glasgow’s Universal Hiking Club, and their number included Robert McFaul, a teacher at Coatbridge College. All five men died in a winter so severe it was four months before all their bodies were recovered. The path starts at a small car park just off the A93 at Auchallater at grid NO 156 822. It was here that the five members of the Universal Hiking Club were last seen, heading up into the sleet. There was no sleet today however. While there was still snow on the hills the sky was clear and bright as we set off and it wasn’t long before a layer had to come off. 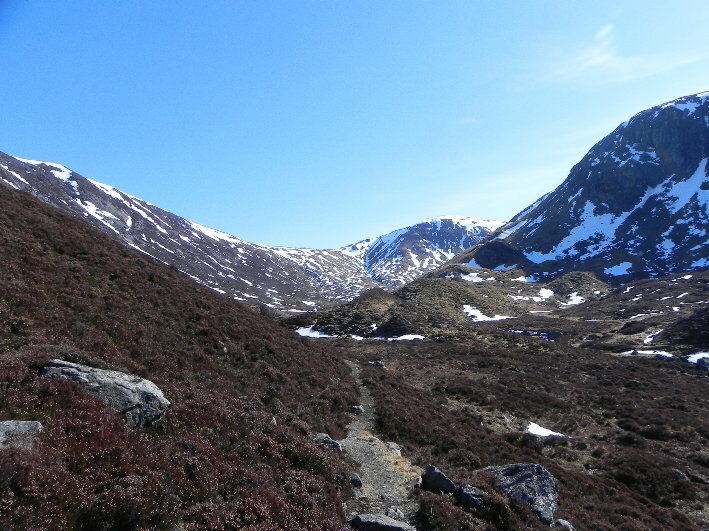 The path at this point is a wide vehicular track and climbs up into Glen Callater and follows the winding Callater Burn south. 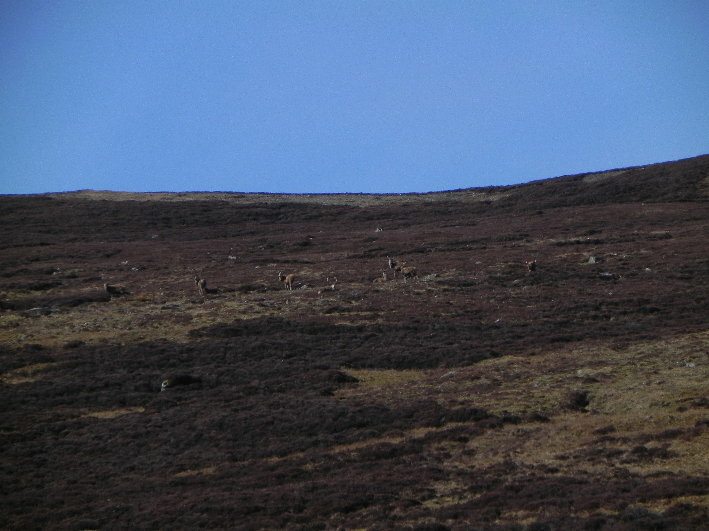 It was starting to get warmer and we could see a good many deer lying up on the hillside, lazing in the sun and unconcerned with our passage. 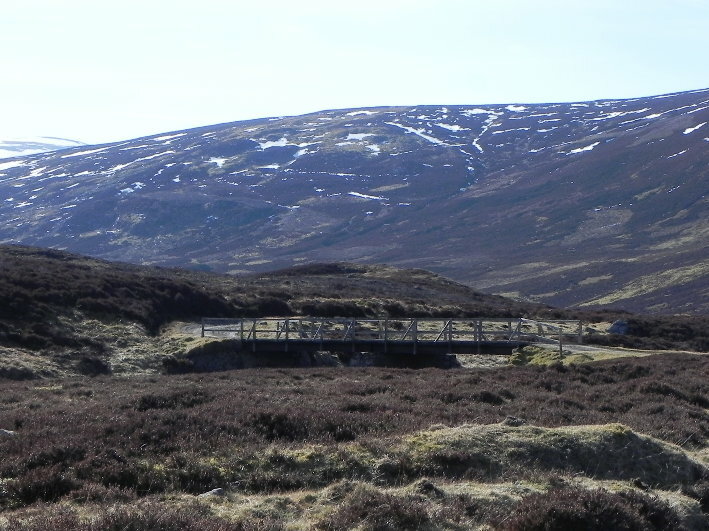 After about 3km the track crosses a wooden bridge at grid NO 163 862 on to the north side of the burn and the glen widens out and heads more south easterly. 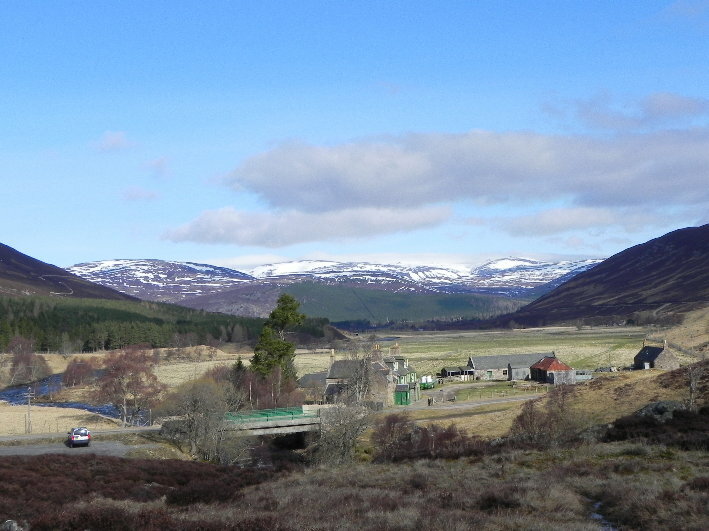 Off in the distance snow rimmed mountains appear and it’s not long before we arrived at Callater Lodge. 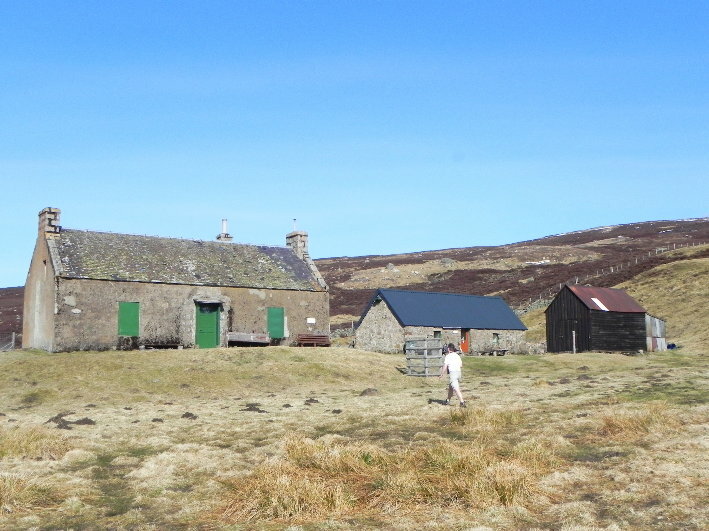 A former shooting lodge, it is now used as a training base for the Braemar Mountain Rescue Team, and the old stables have been converted into a bothy. The view here is stunning, across Loch Callater and down towards Tolmount and Tom Buidhe, our intended targets for the day. 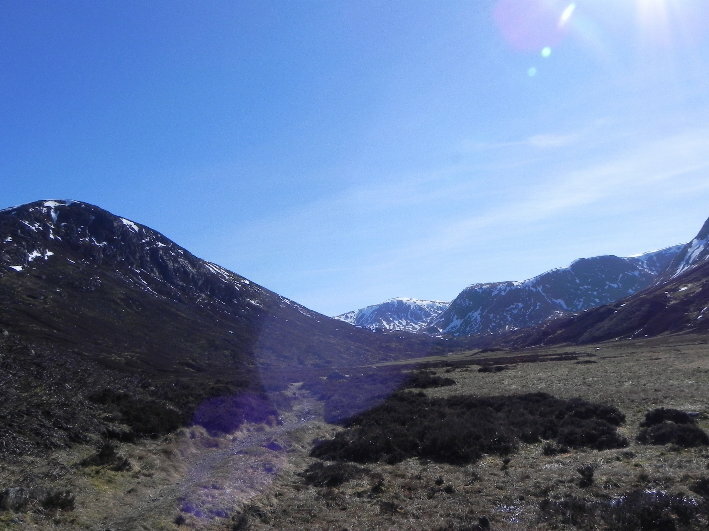 Jim could see a large raptor wheeling around near the crags of Creag an Fhir-shaighde, while goosander swam around in the loch. This is apparently a favourite spot for Prince Charles when he wants to get away from it all, and it’s not hard to see why. We could have happily stayed here but had miles to go, so we dragged ourselves away, and headed along the now narrow footpath on the north side of the loch. 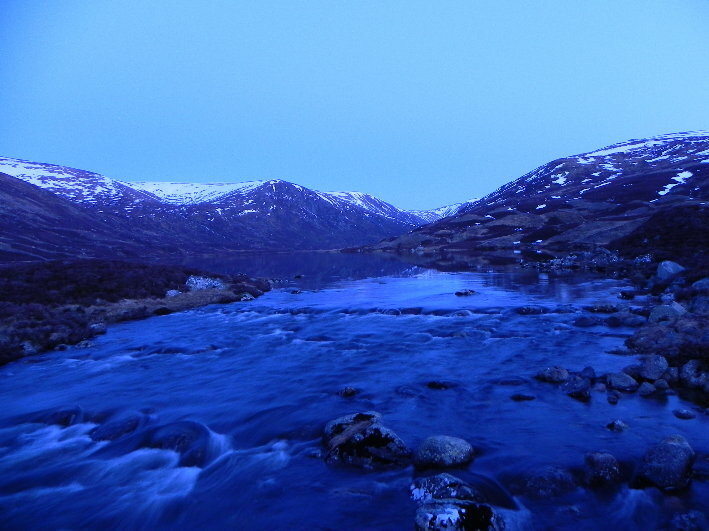 Coming to the far end of the loch we followed the Allt an Loch as it winds along the valley floor. You have to cross over occasionally, either by fording or jumping. The path can be faint at times, but the general line of the path is marked with large stones, not immediately apparent but once you realise what they are you can easily spot them. 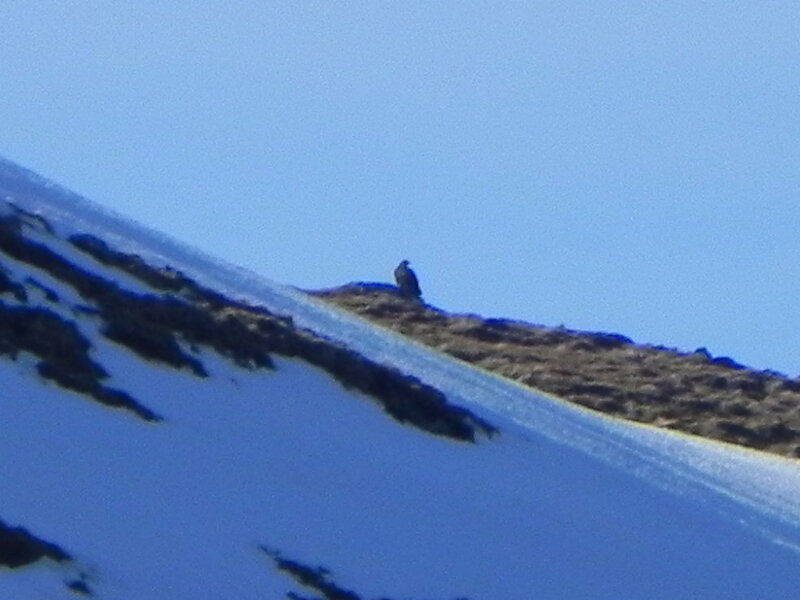 We passed below Creag an Fhir-shaighde, but by now the eagle had flown off. From here the path becomes rockier and climbs up and down crossing a few small hillocks before coming into a smaller “hanging valley”. As we entered this section a roar came from ahead of us and an old propellor driven WW2 fighter plane bearing RAF roundels shot down the valley and over our heads, a wonderful sight. The valley floor was a hive of activity, with pools full of frogs and spawn and hares, still in their winter coats, standing out like beacons against the green background. Climbing up the path became steeper as we approached the lip of the corrie and after another crossing of the burn we sat down, taking advantage of the shelter of the valley for a break, rather than have tea on the top in the wind. It’s at this point that the eagle returns, and sits on a rock on the other side of the glen watching us watching him for a good twenty odd minutes. 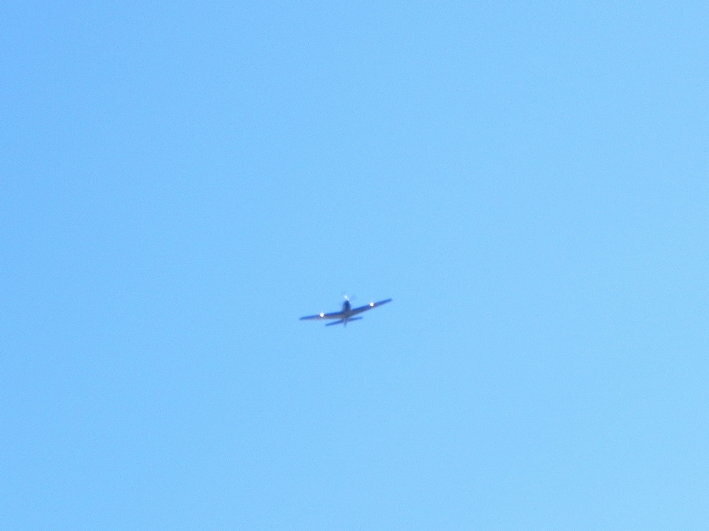 The full zoom lens capability of my camera was stretched to try and get a decent photo. They aren’t stupid, eagles, and eventually he gets bored with us, as we are too big to eat and not a threat he heads off down the valley. Our break over we left the shelter of the corrie for the exposure of the tops. 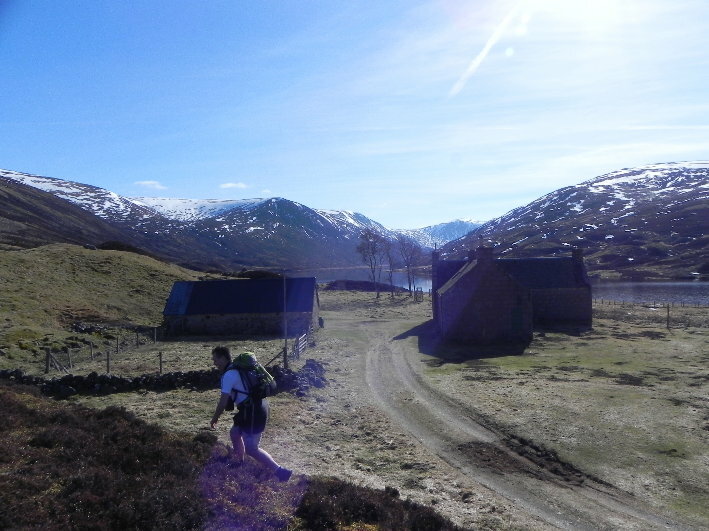 It’s not long before we have ascended south west and gained our first Munro of the day, the accurately named Tolmount (valley hill), at 958m it’s only a metre higher than it’s near neighbour the inaccurately named Tom Buidhe (yellow hill). From Tolmount there are great views in all directions, down Glen Callater, where we had just come, across to Broad Cairn, dotted with walkers, and to Tom Buidhe, our next hill. Just over a kilometre away it’s an easy walk, first south west down the ridge, then over the burn and up crossing the contours of the map at 90 degrees, before heading east up through the snow to the top. 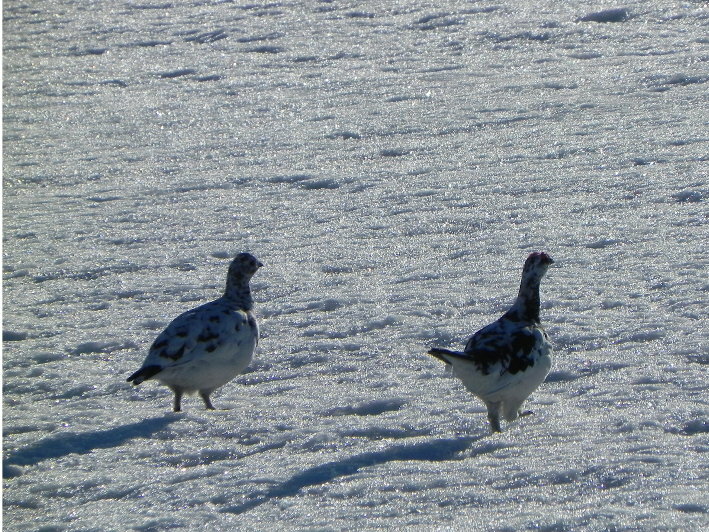 We caught sight of a few ptarmigan as we made our way up, still winterised, hiding along the snowline while feeding on the heather. A quick photo at the summit then it was back the way we came. I’d gone about 400m when I realised that my arms were swinging, but nothing was propelling me forward. A smart about turn and I was on my way up again to collect my poles, sat against the summit cairn. Does that count as a second ascent? Our original plan had been just these two hills, but there was still a bit of the day to go. Looking at the map, Cairn of Claise was easily within reach, and also Carn an Tuirc. We headed up over the oddly named Ca Whims towards the first. Being higher the snow was in greater evidence here, as was the animal and birdlife, with mountain hare, ptarmigan and golden plover featuring prominently. The hills are alive right enough. 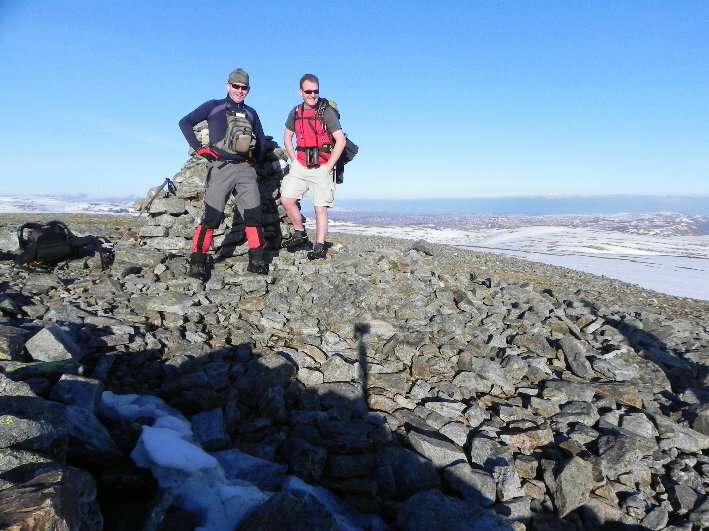 Perhaps tiredness was setting in, and combined with the snow this was more of an effort than the last hill. 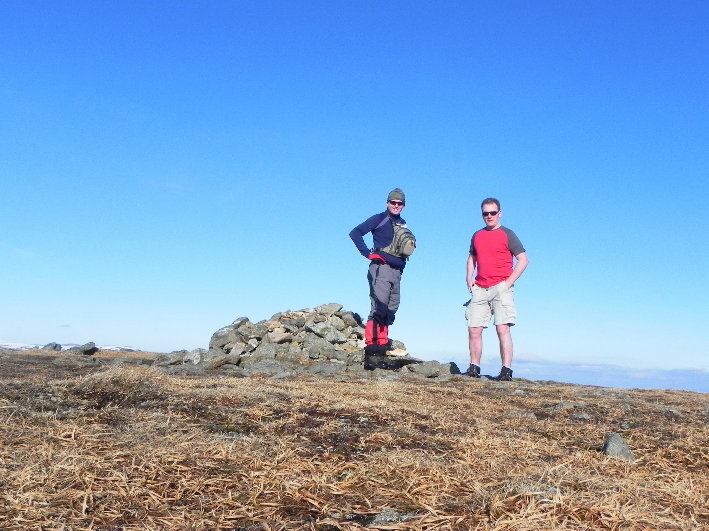 At last however we stood on top at the summit cairn, at 1064m the highest point of the day. As I set up camera using the fence post as a support we were joined, as if by magic, by a Dutch walker on his 6th summit of the day! 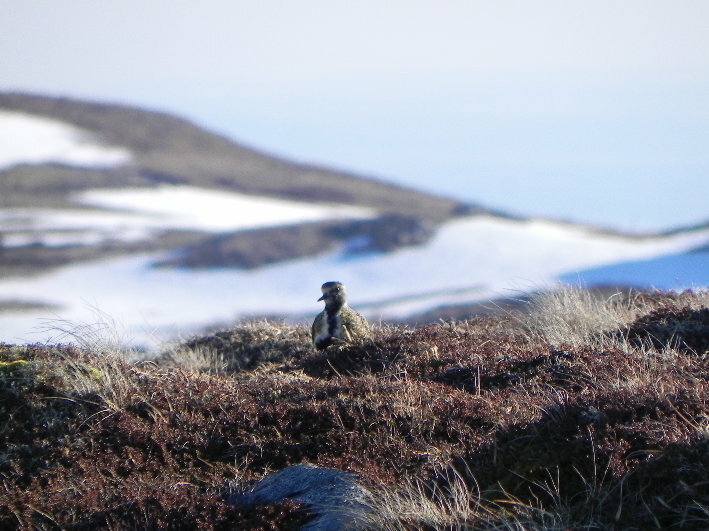 The weather became the topic of conversation, and he pointed out that with clouds in the distance on almost every side it appeared we were at the very centre of a ridge of high pressure. While distant mountains hid under cloud we could see that we would remain cloud free for the remainder of the walk. The light however was not so kind and the sun was getting low in the sky. 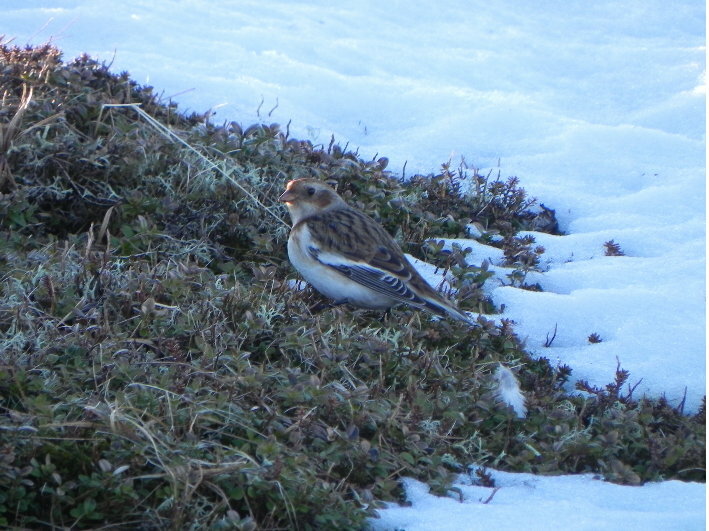 We headed north towards Coire Loch Kander, but with little light remaining we could tell that there was no time to head up Carn an Tuirc, so we headed over to the corrie, passing a solitary snow bunting which hopped along the path ahead of us. 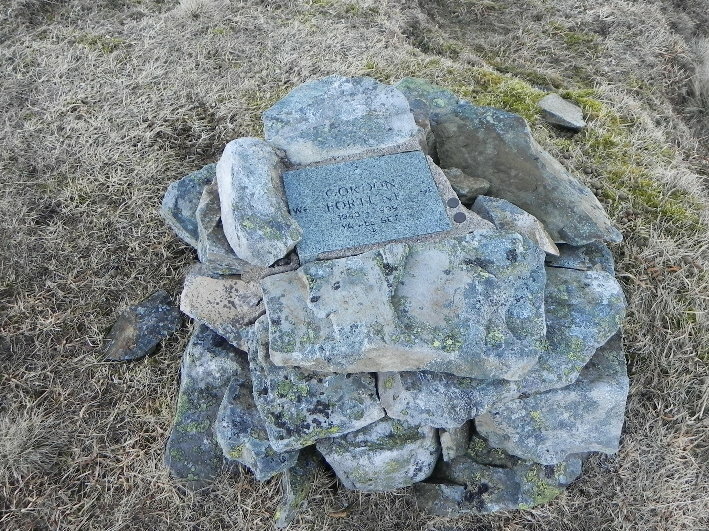 As we came to the corrie I noticed a polished granite memorial stone on the ground, set into a small cairn. Quite unobtrusive, you wouldn’t notice it from any distance, it simply states ‘Gordon Fortune. 1943-1999. Ya All Set’. 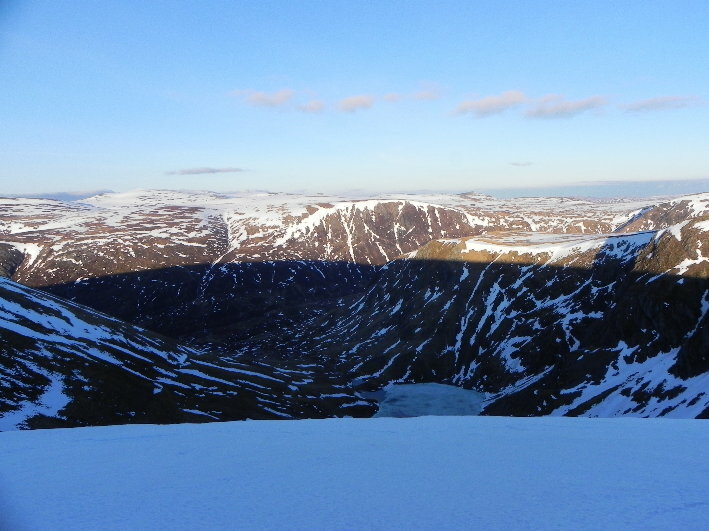 When writing this I searched online for the name and drew a blank, however I mentioned it on a few forums and learned that Gordon had been walking in the area in mid January 1999, hoping to climb Carn of Claise, Carn an Tuirc and Glas Maol. Winter weather conditions became horrendous according to reports, with snow, winds of up to 115mph and temperatures around -20 degrees C, and despite extensive searching his body was not recovered until April that year. His body was found somewhere in Corrie Loch Kander after the spring thaws had commenced. Like the bodies of the five members of the Universal Hiking Club, the winter snows can take their time in releasing those they have claimed. All this was unknown to us as we sat here watching a raven display it’s aerobatic prowess, swooping and wheeling as we watched while finishing the contents of our flasks. It was becoming chilly and the sun was getting lower still, and although we could happily have sat there longer we wanted off the hill while there was still some light. 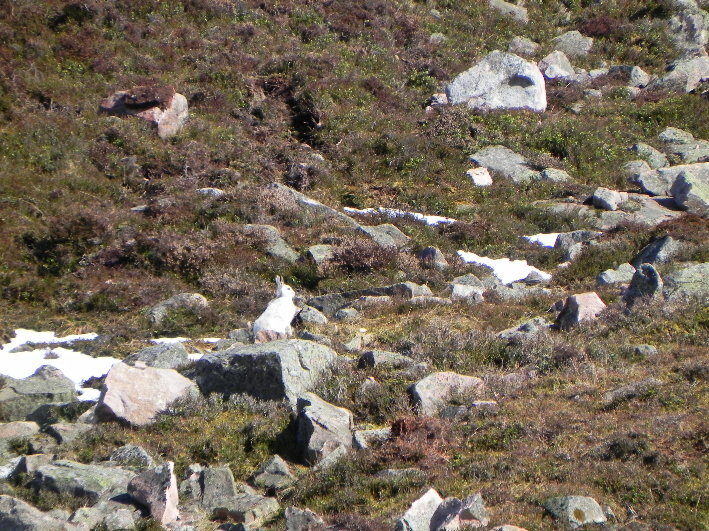 We headed down and picked up the path heading roughly north, scattering hare and deer in abundance. By the time we reached the bridge to the lodge darkness was upon us. We headed back by our outward route. At first one solitary star was visible, to be joined by another, and another until the sky was painted with stars, and my head swam trying to take it all in. The big sky indeed. As we took our boots off in a darkened car park a shooting star tore across the sky, bright and red then fading as it burned out. Eleven hours the walk had taken, just enough for a taste of what this area has. Big hills, big days and a big sky. Fantastic. 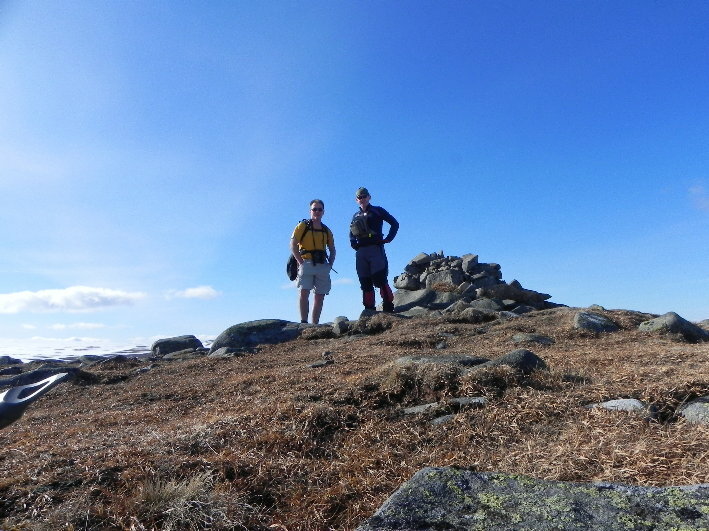 I may be wrong but I think you met Klaasloopt on Cairn of Claise - his report is here and it includes the comment "Two guys are already at the cairn, one of em is in shorts. Style! The other carries a multi-camera bag on his chest like you would carry a baby." which judging by the picture in your report looks like you ? Super report indeed. Seeing the Spitfire(?) would have been an experience I'm sure too. That's us right enough! It's a small world!